Guacamole is one of my absolute favorite appetizers/snacks. I also use it as a topping for a lot of Mexican-inspired dinners. Sometimes I will buy it store-bought for convenience, but honestly no store-bought guacamole I have ever had comes close to fresh, homemade guacamole. And really- to make it yourself takes less than ten minutes anyway. To me, guacamole must be two things to be AMAZING: chunky and spicy. 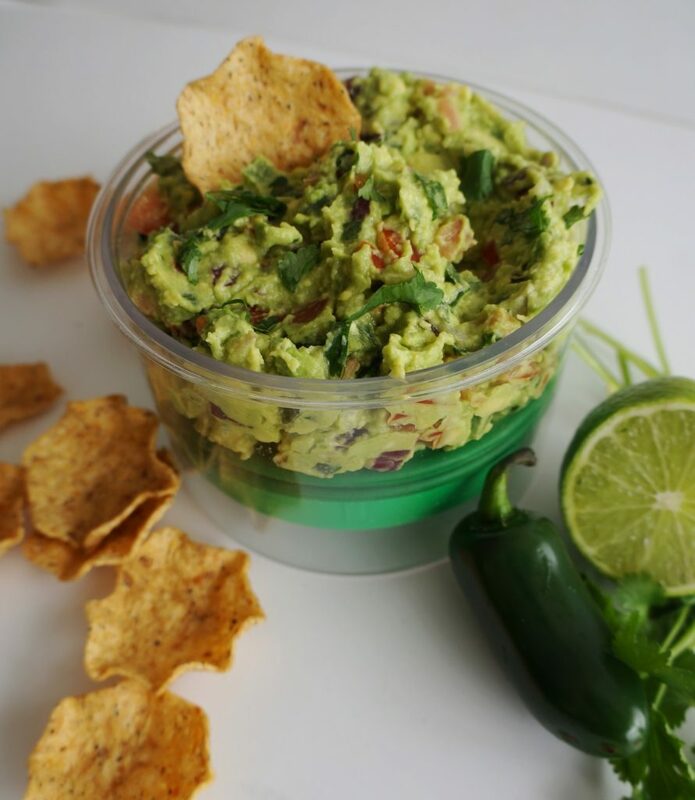 I love adding flavor, color, and texture to my guacamole by mixing in chopped red onion, tomato, and jalapenos. None of that super smooth or plain guac for me. Fresh lime juice, salt, and cilantro finish it off. 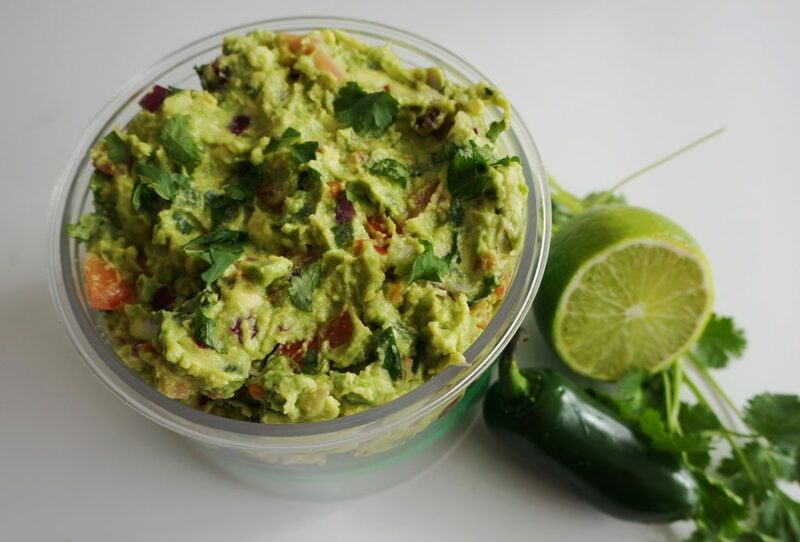 If I need to make snacks for a party, this guacamole is always something I make and it’s always a hit. So many people have asked me for the recipe, but for some reason I have never posted it until now! Another great thing about guacamole: it’s easy to adapt to your taste or to the crowd you are feeding. For a party (especially if there are kids there), I will reduce the amount of jalapeno because not everyone is into spicy foods. If I’m making it just for Kevin and I, I will double the amount of jalapeno. When I wrote this recipe, I used one whole jalapeno, seeds and membranes removed and I feel like that’s the perfect amount for *most* people. It’s also great because it is “safe” for people following special diets (like gluten free, vegan, etc.). I love serving it with multi-grain tortilla chips, but it also goes well with veggies. The recipe easily doubles or triples if needed. 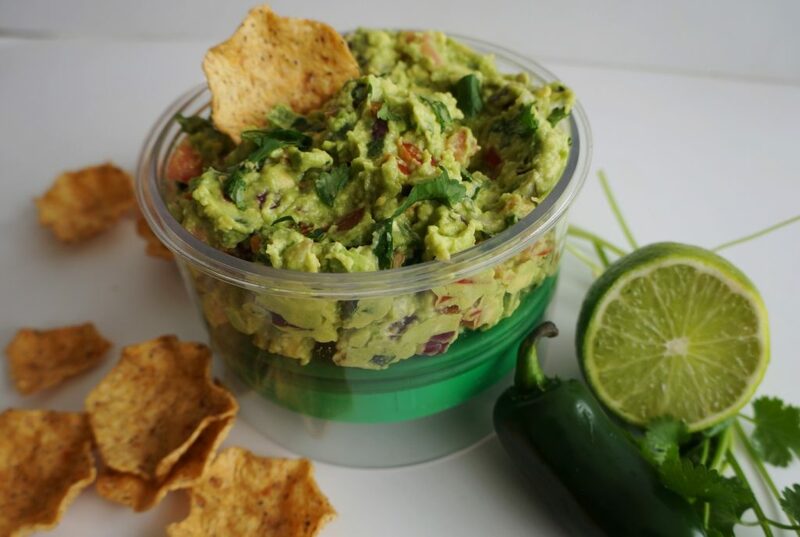 Also, side note about the container my guacamole is in- it’s called a GuacLock and you can find it on Amazon (not sponsored or an affiliate link- just like the product!). The bottom pushes up to remove all of the air from the container and it keeps your guacamole from turning brown. This would make a great dish if you are headed to a Super Bowl party. As I’m writing this, I’m watching the Eagles/Vikings game and hoping for an Eagles win (I live just outside Philadelphia). By the time it’s posted, you will already know who is playing the Patriots in Super Bowl LII! Mash avocado in a medium-sized mixing bowl until creamy with some small chunks. Stir in chopped onion, tomato, jalapeno, and cilantro. Add the fresh lime juice and sea salt. Mix. Adjust lime juice and salt to taste, if needed.